In Malaysian Borneo, while negotiations for the complete protection of Keruak Corridor continue, members of Hutan’s team are working hard in the field with the support of World Land Trust (WLT). Hutan is a WLT conservation partner, based in Sabah, north west Borneo. Hutan is dedicated to saving vital habitat for threatened species such as Bornean Orang-utans. Berjaya Elahan is a member of a team of Honorary Wildlife Wardens in the village of Sukau. His post is funded through WLT’s Keepers of the Wild programme. 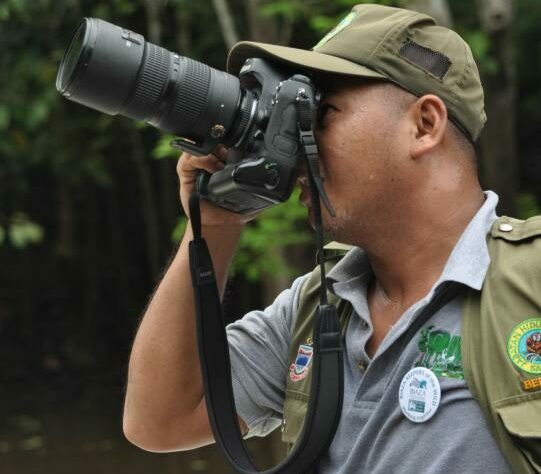 The Sukau warden team is supported by Hutan and Sabah Wildlife Department in a pioneering collaboration that recognises the need to empower the Kinabatangan community in the protection and management of the Lower Kinabatangan Wildlife Sanctuary. The objectives of the Sukau warden team include the protection and monitoring of wildlife and habitat within and around the wildlife sanctuary, human-wildlife conflict mitigation, as well as community outreach projects. “Since its inception, the Sukau wildlife warden team has been remarkably successful in curbing illegal activities and re-establishing more harmonious relationship between wildlife and the Kinabatangan indigenous community. WLT has been a long-term supporter of this initiative, allowing Berjaya and the other wardens to carry out their important work,” said Dr Isabelle, Co-director of Hutan. In the course of his work, Berjaya patrols the Lower Kinabatangan floodplain, checking for illegal activities (mainly logging and poaching). He records wildlife and works with communities, inspiring local people to protect the rainforest and to support conservation initiatives. WLT’s Keepers of the Wild programme is very important to WLT’s conservation partners who might otherwise struggle to keep their reserves protected. When the programme was launched in 2011, WLT supported 10 conservation partners to employ rangers. Today WLT is funding 19 partners to employ 32 rangers in 15 countries. You can support the work of Berjaya in Malaysian Borneo by donating to Keepers of the Wild.